I’m not a museum person. That’s not to say I’m not interested in art, or natural history, or science, or whatever the museum is about. It’s just that I don’t have the patience to concentrate on one thing for very long. At the same time, I’m not physically up to it; for some reason standing still makes my back hurt within a fairly short time, while I can walk for a far longer time before I have any back problems. So if I visit a museum, it needs to be either a very small museum or a very short visit. 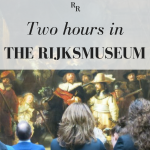 Which is why I rarely go to museums: at €15.00 (the Louvre) or €17.50 (the Rijksmuseum) or $25 (the Metropolitan Museum of Art), for example, a visit doesn’t seem worth the money if you’re only planning to stay a short time. A few days ago, though, a friend of mine from the US was in Amsterdam for just one afternoon, along with his son, on their way to other obligations elsewhere in the country. They wanted to see the Rijksmuseum, as well as walk around the city a bit. 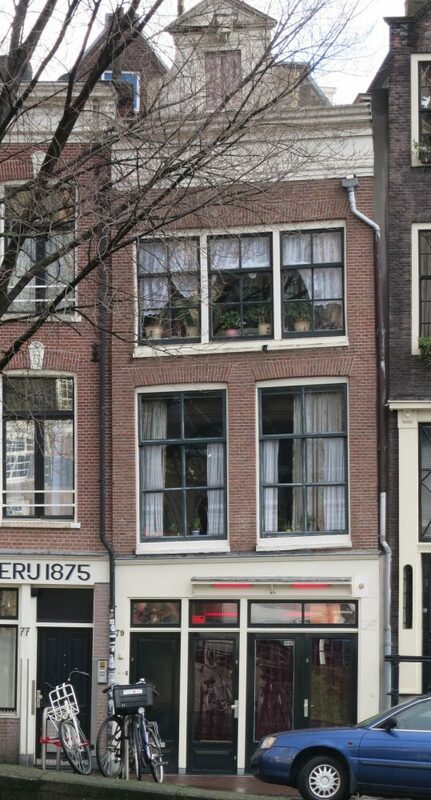 Notice that this particular leaning building is in the red-light district. So that’s what we did: we walked across the city, enjoying the leaning buildings and picture-postcard canal views. What with the walking and stopping for lunch, we ended up with about two and a half hours left to see the Rijksmuseum. If I’d been on my own, I would have headed for the modern art on the top floor. I love the riddles inherent in abstract art: what does it mean? Is my interpretation what the artist intended? 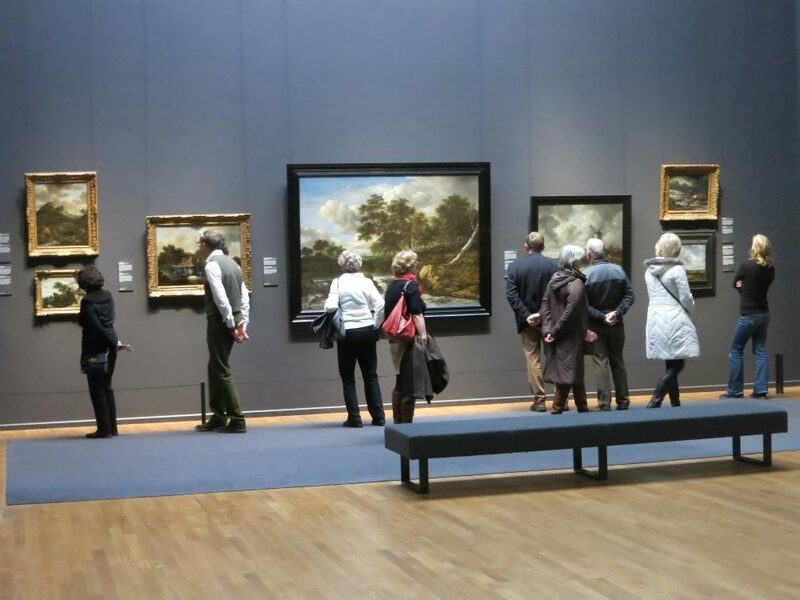 Visitors enjoy the Golden Age paintings lining the Gallery of Honour in the Rijksmuseum. I’m glad, though, that I suggested the Golden Age masters in the second floor Gallery of Honour. It seemed to me that, being from Boston, my friends had plenty of access to modern art at home. They were in Holland, and Holland means the Golden Age: Rembrandt, Vermeer, and so on. After all, many of the buildings we had just admired on our stroll were from the same period of wealth and creativity. By the way, you can read lots of good information about visiting Amsterdam at the Netherlands Tourism website. You might also like to check out my series on smaller museums in Amsterdam: they’re perfect for people with shorter attention spans like me! 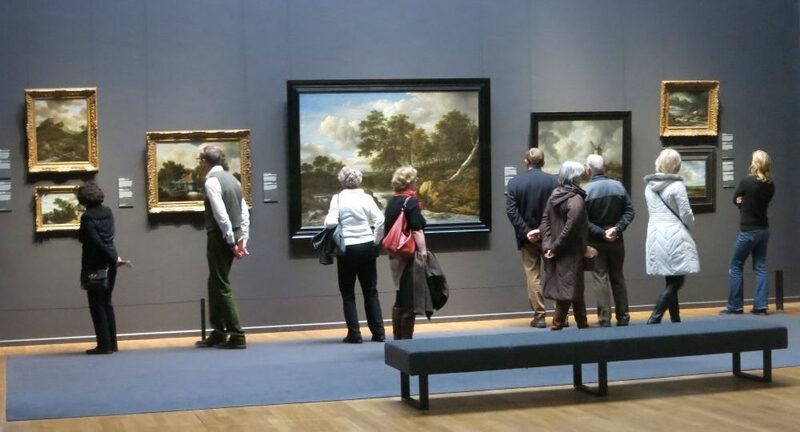 The newly-remodeled Rijksmuseum presents a selection of its Golden Age paintings arranged on both sides of a long, straight hall, with its crown jewel at the end: The Night Watch, by Rembrandt. The Night Watch gets a lot of attention at the Rijksmuseum in Amsterdam. Looking at these paintings in person rather than on a computer screen reveals detail that cannot be reproduced: individual brushstrokes, texture, and so on. It was a joy to see these Rijksmuseum highlights again after so many years. The last time I was in the Rijksmuseum was sometime in the late 1980s. 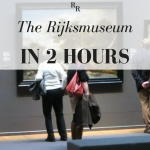 If you want to order tickets in advance for the Rijksmuseum, I’ll get a small commission if you click here. This single hallway is perfect for a two-hour visit. Two hours in the Rijsmuseum allows you to savor any painting that interests you, but not get overwhelmed. For some of the more famous paintings, it’s worth reading the big explanatory cards that are available. They add information about details you might not have noticed on your own, such as the fact that The Night Watch was trimmed down long ago to fit in a smaller space, so that it’s now slightly unbalanced compared to the original composition. Or that Rembrandt struggled with a particular spot on the painting, revealed through an x-ray study. 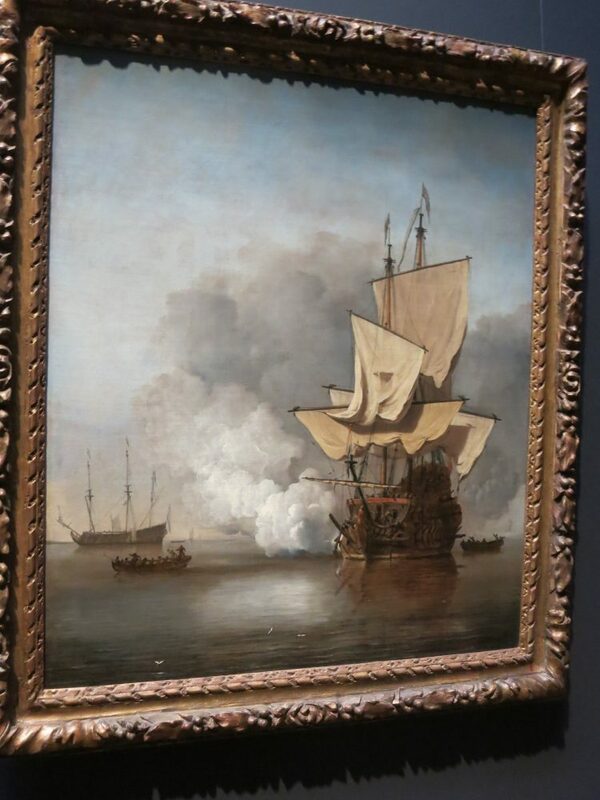 Some of the paintings are positively photographic, particularly the landscapes and seascapes like Willem van de Velde’s The Cannon Shot. Magnificent. I think Vermeer’s The Milkmaid was my favorite, though: the stillness and ordinariness of the scene, the thin light shining from the side. It’s a remarkably small painting, and the detail is exquisite. The Milkmaid, by Vermeer, is one of the Rijksmuseum highlights. Decide what you most want to see. Don’t try to see too much. Don’t try to get your money’s worth. So are you a stay-all-day-and-try-to-see-everything kind of person? Or are you more the pop-in-pop-out kind of person, like me? Leave a comment below! The Rijksmuseum: Museumstraat 1 in Amsterdam (Museumplein). From the Central train station, take tram 2 or 16. From Schiphol airport, take bus 397, or take a train to Amsterdam Central and then take tram 2 or 16. Don’t try driving in Amsterdam! The traffic rules are complicated, there are bikes and pedestrians everywhere, and parking is prohibitively expensive. Open daily 9-17:00. The museum gets very crowded on weekends and holidays, especially in the middle of the day, so your best bet is a midweek morning. Admission for adults is €17.50. Ordering the tickets online might save you time waiting in line. 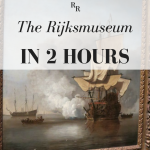 Click on this link to order tickets to the Rijksmuseum (I receive a commission). And if you liked this article, please share it. The images below are perfect for pinning! 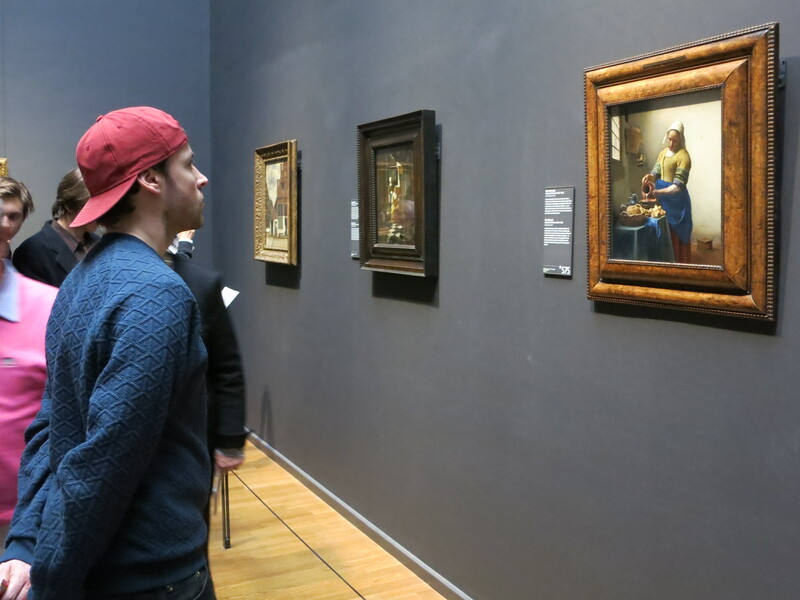 Great advice for getting the most out of museums, the Van Gogh and Anne Frank museums were just the right size I found but I didn’t go to many of the smaller ones you’ve blogged about. I really like the photo of the Nightwatchmen by the way, I didn’t realise how big it was. Apparently it was cut down, so originally it was even bigger! 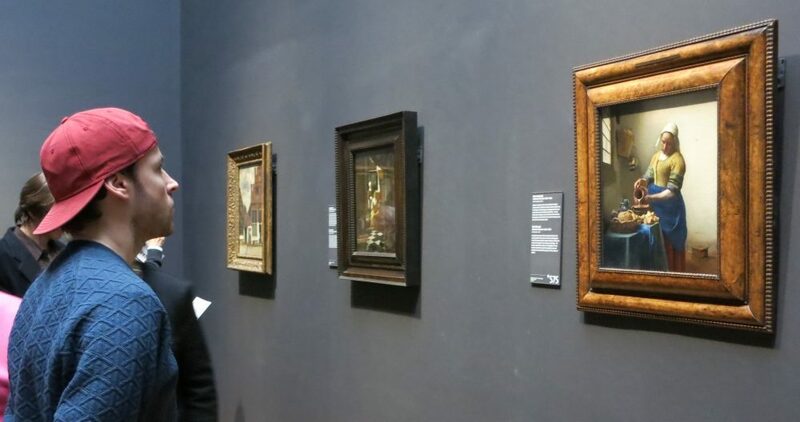 I’ve liked the Van Gogh and the Anne Frank museums too, but they’re more expensive and you have to book tickets ahead if you don’t want to have to wait in long lines. I don’t plan ahead enough, generally. I agree with prioritizing, although that does mean you might miss hidden gems you don’t know about (Gauguin was a carver?!). Unlike you, we can easily spend the better part of a a day in a museum if we take a lunch break. But even that not enough to cover a big museum the way we’d like to. The Rijksmuseum is enormous! You’d probably need two full days to see it all, but I’ve never tried to see it all so I can’t be sure. Thanks for commenting! Hi Rachel. I remember the Rijksmuseum from my visit to Amsterdam back in the 1970s. Thanks for the trip down memory lane. I would go back in a heartbeat. I do miss the great art exhibits in Seoul and the prices were reasonable. Thanks for co-hosting this week. They renovated the whole place recently. 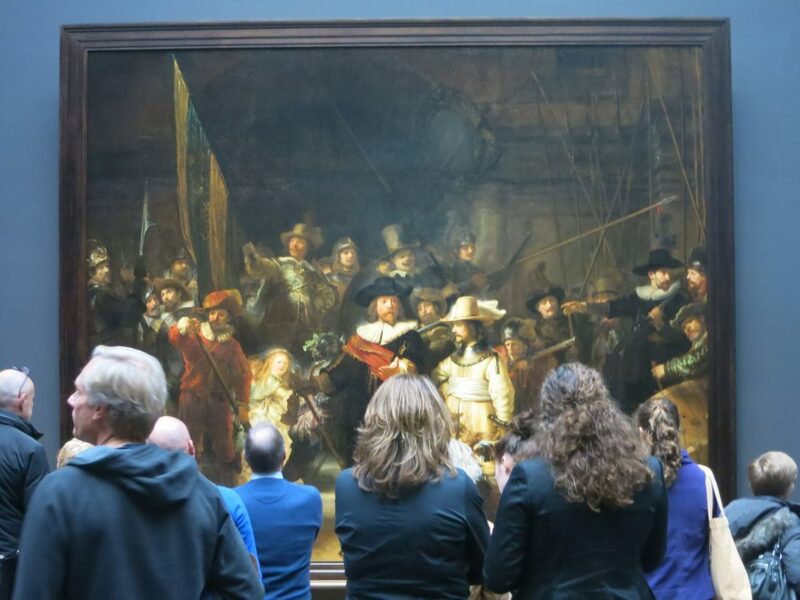 Apparently only that one Rembrandt painting, the Night Watch, is in the same place it used to hang. This long hall with the Night Watch at the end is a new set-up.